A weeping shrub that, when in full bloom, looks as if it is raining flowers. 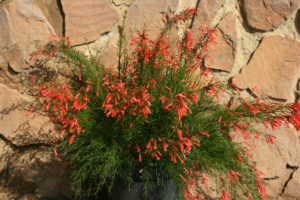 These slender, red, tubular flowers appear in summer and hang on the plant like little fire crackers during most of the year. Evergreen. Plant in a sunny to shaded position. Plants can tolerate cold, but not frost. Mature plant size may vary due to growing conditions and climate, ±1m x 1m.